Zimbabwe’s ruling party is growing increasingly nervous that it could lose power in its first election without Robert Mugabe at its helm against an opposition emboldened by the end of the 37-year rule of the liberation struggle leader. Three members of the Zimbabwe African National Union-Patriotic Front’s politburo, its most senior decision-making body, said the party is concerned that large rallies in rural areas show the opposition Movement for Democratic Change and six smaller allied parties are gaining momentum. Mugabe’s replacement, Emmerson Mnangagwa, has loosened control of the country, allowing more room for campaigning and freedom of expression. The election will pit the MDC’s Nelson Chamisa, a 40-year-old lawyer, against President Mnangagwa, a 75-year-old former intelligence chief. With more than a third of the population between 15 and 34 years of age and an economy that’s halved in size since 2000, there is a “a desire for change,” said Takavafira Zhou, a political scientist at the Great Zimbabwe University in the central city of Masvingo. “The ascendancy of a young MDC president and the quantum leap of unemployment among educated youths have converged to give a new euphoria that has transformed rural areas, with a consequent increase in attendance at rallies by rural people,” he said. Zanu-PF has cause to worry, according to the politburo members, who spoke on condition of anonymity. Parties that led the nearby countries of Zambia and Malawi to independence have since lost power. In South Africa, the African National Congress posted its worst-ever performance in 2016 municipal elections. The MDC has been pulling big crowds in areas where in previous elections their supporters were intimidated and killed by militia linked to the ruling party. The traditional fear of police repression of public demonstrations has dissipated since the military encouraged mass protests just before Mugabe stepped down in November. Chamisa, who was appointed as MDC leader after founder Morgan Tsvangirai died of cancer in February, said in an interview last week that his alliance could win 70 percent of the vote. Yet the opposition’s 10 demands for reforms ranging from making public the voters roll to allowing citizens outside the country to vote have been largely unmet. The MDC has complained that the ruling Zanu-PF Zanu has manipulated the results since it first participation in elections in 2000. Tsvangirai won the first round of the presidential vote in 2008 but decided to boycott the runoff after about 300 of his supporters were killed. In 2002 Vitalis Zvinavashe, the then head of the armed forces, said that the military would not allow a politician who hadn’t fought in the 1970s liberation war to rule. That has not been recanted. 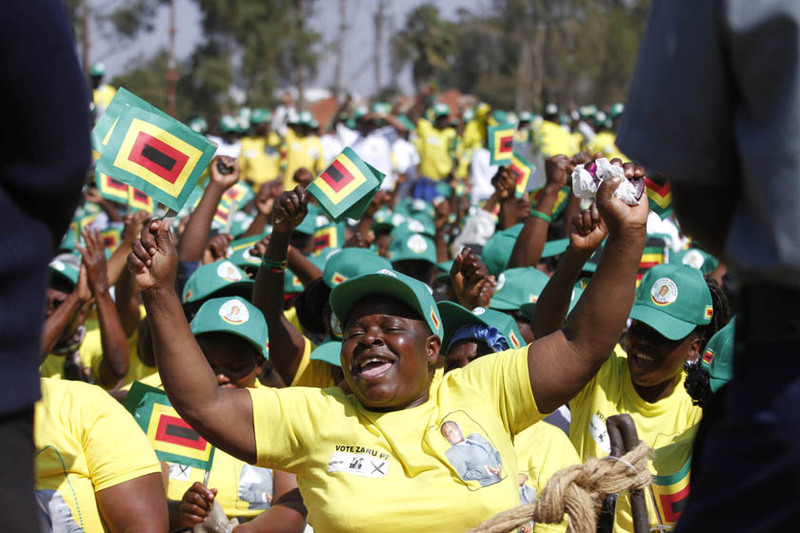 Publicly, Zanu-PF is confident that it will easily win the vote that must be held by Aug. 22. In a January interview with Bloomberg in his offices in Harare, the capital, Mnangagwa said he was “overconfident” of victory. He has pledged an election free of violence and rigging and has promised to allow international observers to monitor the ballot. Yet Mnangagwa is less well known than Mugabe. In some previous elections, he lost his constituency and relied on the former president to appointment him to parliament. Already Zanu-PF has been experimenting with a more democratic approach by allowing open contests in recent primary elections rather than imposing candidates on constituencies. Some of the contests were marred by chaotic organization, police involvement and brawls between opposing sets of supporters. That’s raised concern that the party may perform poorly in national elections.